With the No. 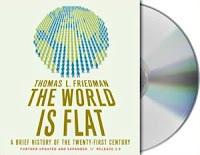 1 bestseller The World Is Flat, Thomas L. Friedman helped millions of readers see and understand globalization in a new way. Now you can have it for free. From now until August 4th, you can download the audiobook version of The World Is Flat and receive an exclusive audio preview excerpt of Hot, Flat, and Crowded.